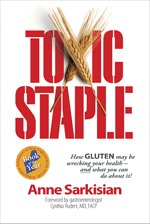 After a short talk on my journey in writing my book, TOXIC STAPLE, within 10 minutes of each other, two different people told me of their friend whose child had been diagnosed with celiac disease. I took a minute to explain that sometimes doctors neglect to inform them that other siblings and the parents should also be tested due to the genetic component of celiac disease. The general answer I get is “Oh, the child (or other children or themselves) was negative.” In which case I inform them that quite often not enough testing is given to detect an intolerance. I can vouch for this myself with just about everyone in my family except for the grandchild that was very compromised and was off the charts positive for celiac. The rest of us all tested negative on the blood tests, and I had read enough to even request 3 tests. I hadn’t discovered the specialized stool test until a few months later. We were all positive on those. If we hadn’t done Dr. Fine’s stool testing I shutter to think how much more our health might have slipped down the tubes. It seems mainstream medicine is setting the bar too high and too often they give only one test and by the time someone tests positive for celiac they have a full-blown case or near to it with very damaged villi (hairs that absorb nutrients)…..and quite compromised health. Testing negative on blood testing to celiac disease or if positive on blood testing, but negative on the endoscopy does not negate gluten intolerance which can also have devastating and degenerative consequences. Be thankful you or your other children did not test positive for celiac disease (yet), but that is not the end of it until you make sure you have received enough testing to detect intolerance to gluten. It’s kind of like preventative medicine. You will need to become your own advocate as few doctors are giving a panel of 4 blood tests, few are recognizing they should also be looking at the lower antibody numbers, and most of them are unaware of a very sensitive stool test that will pick up intolerance in nearly 100% of the cases. If you can catch gluten intolerance before your body becomes so compromised, you are ahead of the game of life. As always, please share my information with your doctor. I spell it out in TOXIC STAPLE with research to back it up. The real story is not just about celiac disease, it’s also, and more so, about whether one is intolerant to gluten. It seems to be a progressively worsening continuum, according to some experts. Commentary On: Your Grain-Free Diet Isn’t Good For You Or the Planet! I take issue with the above quote from the Washington Post: Your Grain-Free Diet Isn’t Good For You Or the Planet by Marie Speck, Oct 30, 2015. I would like to bring to light that in addition to the apx 1% of the population that has celiac disease about 30% may be intolerant to gluten, which means they should not consume this toxic, difficult to digest protein. That’s nearly 1/3 of our population! Tens of millions of Americans are suffering from hundreds of symptoms, diseases, and associated conditions linked to gluten substantiated by thousands of studies from around the world. Many of them are “trying” the gluten-free diet and find they lose weight, gain energy, headaches and tummy aches disappear, skin, joint, and intestinal issues resolve, and a raft of other ailments get better when off gluten. Many think this is just another fad diet, but it isn’t. If health issues resolve with a gluten-free lifestyle that tells me they shouldn’t be eating this toxic staple. It’s important to get tested for celiac and gluten intolerance, but that’s another whole can of worms since too often not enough testing is given to detect the problem and patients are told they don’t have an issue with gluten and can keep eating it as they continue to suffer. I spell it out in my book.